Wind in your face, spine flexing, legs stretching. For some it is the thrill of the hunt. For others its about the pleasure of carrying something, anything in their mouths. It’s all about the dummy! Some live to delight their handlers, thriving on the approval and pleasure they generate as they return with his prize. For many of course, it is a combination of two or more of these factors. But for some dogs, their priorities are quite clear. It is all about the dummy. The dog that wants to possess the dummy can be a real problem. It may be difficult initially to get a good delivery established. Once that has been achieved, the handler may think he has won. But in reality, with this dog, the problem is likely to rear its ugly head again. The dog may come up with a variety of innovative ways in which to defer the point at which he parts company with the dummy. This will directly impact on the way in which the dog returns to the handler. Because for this dog, every time he returns, he is effectively (in his eyes) being punished. So, how do we reward the return in a dog that does not want to share his beloved dummy. One answer is high value edible rewards. However, you cannot just start feeding a dog for delivery without any preparation. He’ll just start spitting out the dummy. You need to work through a process – the clicker trained retrieve – and this takes time. What is more, arguably, high value food may simply not be enough for some dogs. For these dogs, the dummy is the ultimate prize. And this can make the handler’s life difficult. One way around this problem is to reward the retrieve with what the dog really wants, which is another dummy. And to give the dog this reward as soon as possible after the delivery. And to do this, we can use a technique I call the ‘switch’ retrieve. 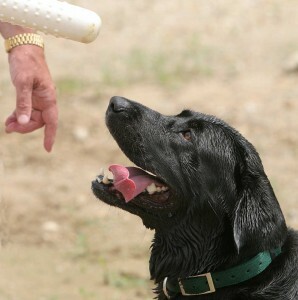 The switch retrieve is for dogs that love retrieving, but much don’t like handing over the dummy. Don’t try this with a lack-lustre retriever. With my method, you need to have taught your dog to ‘line’ back first, and he should be steady. You’ll need two dummies in your hand, and the dog at heel. Walk the dog at heel along a straightish track or path. Sit the dog and drop the dummy A in front of him. Turn 180 degrees again to face dummy A and line the dog up at your side. Send the dog ‘back’ and immediately throw dummy B a few yards behind you, in the opposite direction from dummy A. When the dog returns with dummy A, line him up at heel, take the dummy and immediately send him for dummy B, throwing dummy A behind you as you do so. When he returns with dummy B, line him up to face dummy A, take dummy B from his mouth and send him, throwing dummy A behind you as you do so. The dog is running in one direction and then in the other in quick succession. Every delivery of the dummy is immediately rewarded by another retrieve, another chance to grab another dummy. Like all drills, this one comes with its own problems. Repeatedly sending the dog very swiftly, can damage steadiness. Make sure your dog does not set off for a retrieve before you give the ‘back’ command. Line him up along your outstretched arm and hold it there for a couple of seconds, before you say Back. Every now and then, you can surprise your dog, break the rhythm of the game by picking a dummy up yourself. If you cannot, or don’t want to, stop your dog with a NO then you might want to put him on a line and harness for this exercise, so that you can prevent him self rewarding should he break before you send him. Alternatively, you could probably do this with friends and have people stand by the dummies and step on them if the dog breaks. This should be a very swift and fluid process with the dog barely pausing before being sent. Watch the dog closely. If your dog is an ideal candidate for this, he won’t start to flag for quite a while. Certainly not before 10 to 15 retrieves. What you will see is an improvement in his demeanour, his willingness to give you the dummy, in anticipation of the next one. This may happen in a single session. Stop as soon as you notice him losing the edge off his speed, or once you are happy with the improvement in his return. End with a great delivery. I have a golden retriever who has great drive and lots of enthusiasm but does not like to give up the dummy. I have tried the treat method but she just spits out the dummy to get the treat quickly so I gave that up. This sounded like such a great idea. I tried it on sunday and she was showing a definite improvement. Many thanks for the clever and insightful articles.